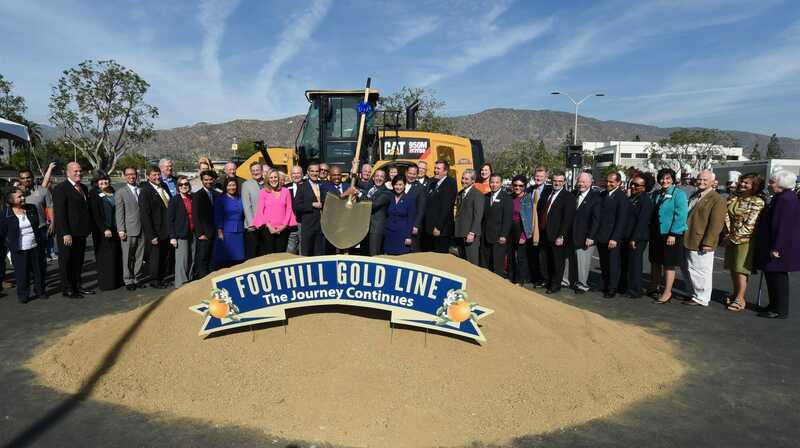 Officials in Southern California have broken ground on a $1.5 billion extension of the Foothill Gold Line between Glendora and Montclair. The new line will extend the Metro Gold Line by almost 20 km from its eastern terminus in Azusa. New stations will be built in Glendora, San Dimas, La Verne, Pomona, Claremont and Montclair. Preparatory works are now underway while the Foothill Gold Line Construction Authority appoints a design/build partner to deliver the extension. Major construction works aren’t expected to begin until 2020, with the extension due to open to passengers in 2026. Announcing the official ground breaking, Foothill Gold Line chief executive Habib Balian said: “The Construction Authority’s team has been working tirelessly over the last few years to ready the Glendora to Montclair segment for construction. “Today is a celebration of that tremendous effort, as well as the partnership that the Construction Authority has with our corridor cities and Metro that allowed this project to be the first Measure M funded project to move forward.